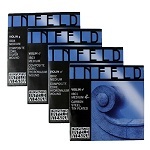 Combining an unbeatable price with Thomastik-Infeld quality means you no longer have to settle for solid-steel strings to assure durability. 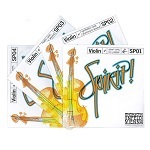 You will love their instant response, supple playability and colorful tone. 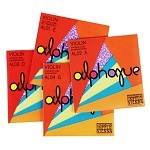 Alphayue strings also improve the sound of even the most basic student instrument and make music-making a treat! Infeld Blue strings radiate strong power and brilliance. Mix and match within the Infeld Red and Blue string system to realize your sound ideas! The perfectly attuned strings with identical tension enable you to modify your tone and assemble your sound to your individual liking, personal needs and unique style! Wound on an advanced synthetic core, the Infeld string system is designed to cover the entire tonal spectrum, enabling players to achieve string-by-string tonal preferences without the headaches of uneven string-to-string tensions. 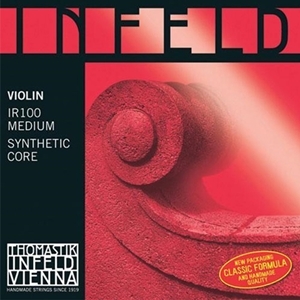 Infeld Red strings are designed to create a powerful, warm and expansive tone. 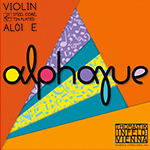 These strings are excellent for soloists. And Infeld Blue? Find out on the next page!